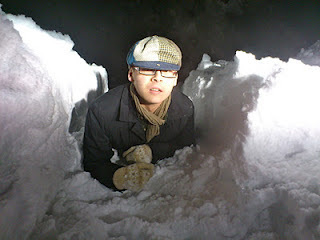 Today's interview is with Vicky, a fellow Brit who lives in Hokkaido and blogs at Hyotenka. Vicky constantly amazes me at the way she 'gets through it all' with her husband living away due to him being in the Self Defence Force, Vicky pretty much does it all single handed, a feat I would never manage here! I’m Vicky, I’m from England and I’m married to Seiju, who is Japanese. 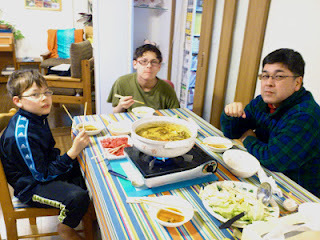 We live in a small town in Hokkaido with our two sons, Yoshi, 15 and Harry, 11. I needed a new job and was scouring the papers when I saw a tiny little ad that just said, “Teach English in Japan” and a phone number. I looked at it and looked at it, and then decided to screw up my courage to answer it. I thought that if it sounded dodgy then I could just slam the phone down! But the voice at the other end answered with “Good afternoon, Japanese Embassy” so I reckoned that was safe enough! It turned out to be an ad for the JET programme which I had never heard of, but it sounded interesting and fun, so I gave it a shot and applied for it. I wasn’t interested in Japan per se, I just wanted an adventure for a year or so! In the end I did the maximum three years on the JET programme and mostly enjoyed myself, and learned a huge amount about all kinds of things in the process. When/when/how did you meet your husband? A week after I got to Japan! Well, I met him, but I don’t remember it because I had met so many people with completely unfamiliar names that they had all become a blur. Every week when we met, I had to say “I’m sorry, what’s your name again?” until it got too embarrassing to ask any more, so I just called him “The Dark Man” in my head, and nothing to his face. It took me another six months to remember his name! We became friends over the course of my first year here, and started dating about another six months after that. With your husband being in the SDF, he spends a lot of time away from home, how does this work for your family?It’s not much fun, but it’s partly self-inflicted. Yoshi, our elder son, was not happy at school and hated to move every three years or so. He found it very hard to settle in each new place, and then very upsetting to lose all his friends again. We had planned to find a house in Seiju’s home town by the time Yoshi was about ten or eleven years old, but we found a very big, reasonably priced house by chance when he was only seven. It was too good an opportunity to miss, so we took the plunge and decided to live separately.We didn’t realise when we started this that we’d still be living separately eight years later… We have probably lived apart for more than a third of our eighteen year marriage. Some of the periods were three or six months long, but we have now lived apart since our younger son was three, with a one year break in the middle when he was six. What do you find the most difficult about the situation? It’s hard to have to do every single thing by yourself. The kids have had to learn to be very self-reliant, which is nice in one way but it was forced on Yoshi a bit early, I think. It’s lonely in the evenings when the kids have gone to bed and it’s just me sitting downstairs. We miss a lot of school deadlines because I put the papers aside for Seiju to read the next time he comes back, only to either forget to give them to him, or for him to find that whatever it was about is long over!I also feel sorry for Seiju that he lives in a small cold apartment with only the basics, while we live in the big, warm, bright house, and are surrounded by our friends. I imagine you would prefer for your husband to be working from home but are there any plus points to him working away so much? This is going to make me sound really bossy, but having to look after the kids myself means that we do things MY way!! I also get lazy about cooking and just do sandwiches or simple one-plate stuff that I’d feel a bit bad giving to him. This is bad for me and the kids too, I realise, but it’s easy!The best bit is that we have never had the chance to get sick of each other. I still feel like a single woman whose boyfriend visits most weekends. I love the thrill of Friday night where we all have our ears tuned for the slam of his car door and his key in the lock. You run your own English school, how do find running a business in Japan? Do you have any pearls of wisdom for anyone thinking of taking that route? This is a huge question! !I love having my own business and being my own boss, setting my own schedule and not having to answer to anyone else. It’s hard if there is a problem though because there’s no-one to pass it off onto! I’ve been free to set up my classes the way I want, and to tweak them as I learn and gain experience. I was surprised at how easy it was to start the school - I started with a small ad in the local paper, which attracted three or four students, then I got another three or four by word of mouth, and it slowly grew from there. I was able to get used to teaching by myself and then bit by bit add classes until now seven years later, I’m about at the maximum that I can deal with, which is nice. Pearls of wisdom….. Hmm. Have someone who you can trust wholeheartedly to help you with any Japanese business stuff that comes along. 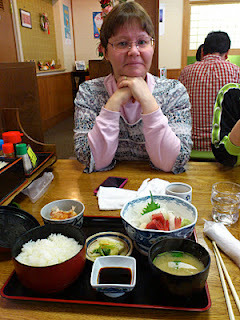 I have a wonderful office manager, Sachiko, who started as my student, became my friend, and then my right-hand woman. She works part time for me but does a HUGE amount in those hours. She is my sounding board, giving me advice about what will or will not work, and she helps me with the day-to-day slog of the business side of the school. I also pay an accountant to do our books. I was told that this was a waste of money, that you can file yourself and the staff at the tax department will help you. They will, but it’s very complicated and there are a lot of rebates and discounts that you need to know about to claim. I know that even with the money the accountant costs me, he saves me a lot more. And I get peace of mind knowing that we are doing everything properly. I know you are going through the awful stages needed to get your eldest son into high school, can you tell us a bit about the process and what makes it so challenging/annoying. I’m exhausted – we are right at the peak of it all now. (Trough?!) Compulsory education stops after junior high school, so students have to decide whether to finish their education at 15 and find a job (not a great idea) or go on to high school. They must research the schools available to them, and make their own choice about which to apply to. In Hokkaido students can apply to two private schools and one public school. The private schools write their own tests but the public schools use the same Hokkaido-wide test, and adjust their required scores up or down according to the level of the school. It’s been a long process of buying catalogues of schools, looking for ones that are about the right academic level, going to open campus and recruitment seminars, then applying (the junior high school did help a lot with this bit but we got little to no help with the selection of the schools). Then the students have to go to each school to take the exams and wait for the results. Right now Yoshi has done the two private school exams, has the results back for one (his third choice, he passed!) and is waiting for the second set of results. The public school exam is on the 6thMarch, and the results will be out on the 16th. On that day the kids have to make a final decision about which school they will go to (if they have a choice, depends on how many exams they passed!) then the parents have to pay obscene amounts of cash if the kids end up going to a private school, and merely large amounts of cash if it’s a public school. 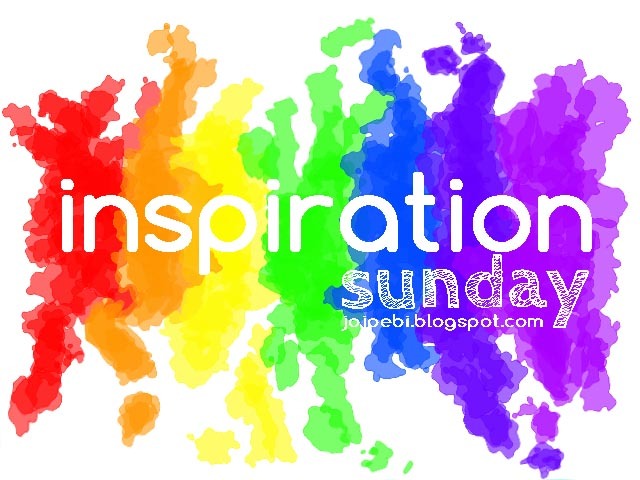 When you are not juggling being a mother, running a business, teaching, shovelling snow, what do you like to do for downtime? I love gardening, as reading the summer entries on my blog will show. We have an unusually large garden for Japan, and I spend a lot of time out there during the season. I also like walking – the area we live is very open and fairly flat, and the market gardening type of farming round here makes it an attractive place to walk. I also like blogging, both writing and reading other blogs (mine doesn’t really have much of a focus – apart from endless garden posts in the summer, it’s just a diary of what we’ve been doing lately.) I also like photography to a point – I enjoy taking pictures but I’m not an expert and I’m not that interested in the mechanics of it! I feel very fortunate that so far our boys haven’t got to the “parents are so embarrassing” stage and both are still willing to go out on day trips and holidays with us. This past year has been lost to exam preparation but we are all looking forward to getting out together again soon! You have made Japan your home, can you share with us some of the things you love about the place? I love that people are polite, that in our area at least there is little crime and it’s safe to walk at night. That people generally are tolerant and kind to little kids, that kids play outside unsupervised and that generally it’s a safe place for kids. I like the Japanese kindergarten and elementary education in general. Of course I have some niggles but on the whole it’s a well-balanced curriculum with lots of sport, music and social experiences. Customer service is good, and so are the post office and the private shipping companies, which deliver at all hours and any day of the week. And finally a question from Ebi-kun... what is your favourite dish from Hokkaido and your favourite dish from home? Hmmmm. I loooove sushi, which is very good in Hokkaido but I’m not sure if that counts as a real Hokkado dish. I love miso butter corn ramen! That’s very Hokkaido!From home, it would have to be a good Sunday roast – any meat, with lots of vegetables but preferably Brussels sprouts in there, and Yorkshire pudding and gravy. Heaven! Thank you Vicky, we have to agree with the Sunday Roast! Hopefully we will get a chance to catch up in real life again some time soon. Oh I love this interview! I have been reading her for so many years and she is such an inspiration. But I feel like I stepped into the middle of the story, and don't know the beginnings, so thanks for ferreting that out Jojo! I really appreciate that Vicky shares so much about the school process. When we eventually have to deal with it I will be better prepared due to her passing on her wisdome. Thanks Vicky! HEY! How did I miss this? Well, I found it through pinterest-0 yeah! get you - suddenly all tech savvy!